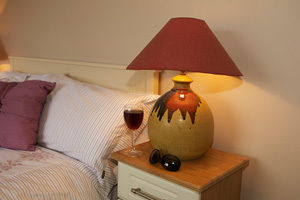 At Laburnum Lodge you will be staying in one of our six luxurious individually styled en-suite rooms. 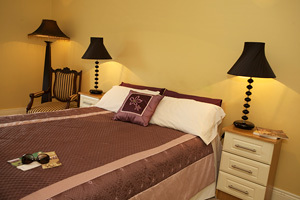 Rooms to the front command picturesque views of our landscaped gardens and beyond the Slaney valley leading into the nearby town of Tullow, nestled under the steeple of the local church. Views of Mount Wolseley golf course and the hills. Rooms at the rear have splendid views of our gardens and rolling countryside. 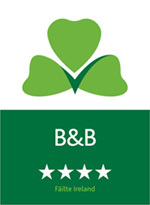 All rooms are well equipped with Tea/Coffee making facilities, T.V. hairdryers, electric blankets, orthopaedic beds. Our spacious bathrooms are well equipped with power showers, pleasantly noted by our guests. In our home, we believe space is of the essence, hence, our rooms are well proportioned bright and airy. 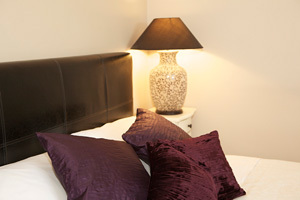 Two of our ensuite bedrooms are on the ground floor, often welcomed by the weary traveller with heavy luggage!